Yehuda Yitzhak, who was critically wounded in Gaza in 2014, shows miraculous signs of recovery during family celebration. When war broke out on Israel’s Gaza border in 2014, Yehuda Yitzhak was enrolled in an elite officer’s training course. Exempted from the fighting, he nevertheless begged his commanders to be allowed to serve his country on the front line. After completing the training course, his request was granted, and Yehuda Yitzhak joined his comrades fighting in southern Gaza as part of Operation Protective Edge. As they entered the city of Rafiah, he enjoined his troops to leave behind their fears and other concerns, to concentrate solely on the coming battle. “Now we forget our home and family – and we are for the Nation of Israel.” This was especially true for Yehuda Yitzhak himself, as he was leaving behind a pregnant wife and young daughter. Tragically, however, during the fight in Rafiah, he was critically wounded, suffering a near-fatal wound to the head. Shrapnel penetrated his skull, entering his brain, leaving him unconscious for an extended period and rendering him unable to speak. His second child, a son, was born while he lay unconscious in Soroka Hospital and the baby's brit milah was held there, with his bed moved to be near it, although he did not respond. His father teaches at Morasha Religious Zionist elementary school in Kiryat Moshe, Jerusalem, and the night prior to the brit, his entire class came to the hospital by bus to say the Shema prayer at the infant's crib and pray for Yehuda Yitzhak's recovery. After a series of eight operations, Yehuda Yitzhak made a remarkable recovery, regaining consciousness and the ability to communicate. But still, he remained unable to talk. 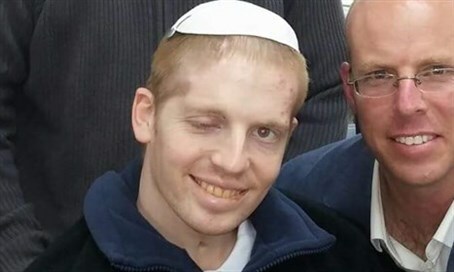 During a recent family celebration in Har Bracha, however, Yehuda Yitzhak demonstrated his improving condition, smiling for photographs with relatives, and even speaking. His uncle, Yoni HaYisraeli, spoke to Arutz Sheva about his nephew’s condition and the renewed optimism for a complete recovery. Yehuda Yitzhak’s appearance at the celebration was no small accomplishment, HaYisraeli told Arutz Sheva, but was a special moment for the family.